The Jumping Spider has a black, hairy body with white spots and a green coloration around its mouth. It has 8 eyes, but two are much larger than the rest. It can jump 40 or more times its length to catch its prey. They will run or jump away when threatened by humans, and typically do not infest indoors. 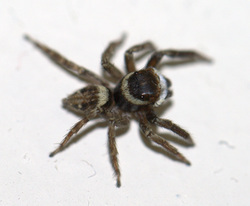 You may see a Jumping Spider in your home every now and then. They will occasionally hitch a ride on clothing. Click here for more information about the Nursery Web Spider!